Travelling is amazing. A few years ago, I travelled to (and ended up living in) Nashville, Tennessee. Home to country music, fantastic coffee, and most importantly, home to some of the best bbq I’ve ever eaten. I was absolutely done. I’d arrived in heaven, and was immediately spoiled for anything slow cooked and covered in sauce. 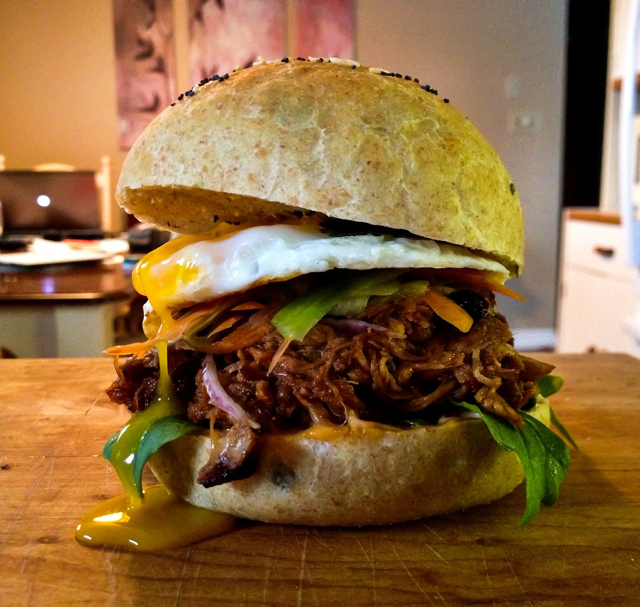 This is an Asian twist on my favourite Southern bbq dish, pulled pork, Hoisin style. A little spicy, and a little sweet, this honestly pairs well with almost anything (probably even ice cream). In a medium bowl, mix together your hoisin, soy sauce, lime juice and stock. Peel and finely dice your garlic, onion, chilis, and ginger. Using the side of your knife, (or a pestle & mortar) crush the peppercorns. Mix everything together, and add your salt. Place your pork shoulder in a large dutch oven and pour over your bbq sauce. Cook for 25 minutes at 450, then lower the temperature to 325, and cook for an additional 2 1/2 – 3 hours, until the pork shoulder basically falls apart on its own. Place the pork on a cutting board and using two forks, pull the meat apart. Place the pulled pork back into your dutch oven and mix well with the amazing bbq sauce. This is fantastic served on a bun, with honey garlic noodles, on pizza, on nachos etc etc etc. Tomorrow I am having family and friends over to watch the Grand Nationals here in England so I hope I can make this dish just like in your photo. My family loves hoisin sauce so wish me luck!